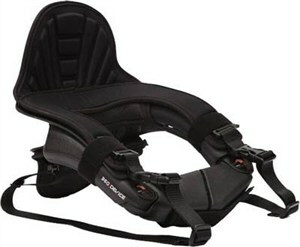 The Team Valhalla Neck Brace / Support Kart is designed to protect that wonderful neck of yours in many ways. First of all, this brace is approved for use in the WKA (World Karting Association), which is the world's largest sanctioning body for the world of go-kart racing. That pretty much says that this brace is going to keep your neck from snapping like a twig as if Steven Seagal snuck up behind you to take you out of commission. How does it protect your neck so well? Well, its components are constructed of foam that is much denser than the normal neck collars currently out on the market. This instantly creates less head movement in the event of a crash. The braces of the core piece are designed to help control the rear hyper-flexion (the movement of your noggin) but still allow you to move your head side to side without any hinderance from the brace. If at any point your helmet comes into contact with the brace (in the event of a crash), the brace will transfer the energy from your neck onto the your upper torso area (which is much more resilient to stress than our necks). While the Team Valhalla Neck Brace can't possibly stop every and all injuries that can occur, just having the added protection should make you feel safer out on the road.